Apple will begin migrating to Intel CPUs next summer, but the PowerPC isn’t dead yet. 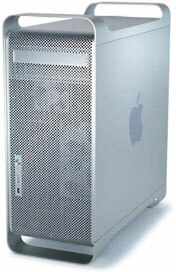 Nowhere is this more evident than with the new Power Mac G5 models, all of which use IBM’s new dual-core CPUs. Until now, Apple had used two separate G5 CPUs in their dual-processors Power Macs, but the new CPUs provide that much power in a single chip that holds two CPU cores. And it gets even better. The earlier G5 CPUs had 512 KB of level 2 cache onboard, and the new PowerPC 970 MP incorporates 1 MB per core. Right there we’re going to see improvements in efficiency as more code will be stored in the cache, reducing the number of times the CPU has to go to main system memory. And that’s where we find another improvement. Earlier G5s use 400 MHz DDR memory, but the new Power Macs (like the new iMacs and new 15″ and 17″ PowerBooks) use 533 MHz DDR2 memory. And it gets better at the top end. The previous speed champs ran at 2.5 GHz and 2.7 GHz, which are 3.125x and 3.375x the speed of DDR memory. The new power champ, the four-core 2.5 GHz Quad, runs at 2.34x the speed of main memory. Finally, the new Power Macs support up to 16 GB of RAM, twice as much as before. PCI Express is something new to the Macintosh world, and the newest Power Mac G5s have 4x, 8x, and 16x PCI Express slots. That’s fast – so fast, in fact, that there’s no longer any need for a dedicated AGP slot for a video card. The Nvidia 6600 video card uses a 16x slot for ultimate speed. That’s twice as fast as AGP 8x. PCI Express also gives dedicated bandwidth to each expansion slot, so add-in cards are never competing for system resources. Everything about the new design is optimized for speed. A few people have managed to run Xbench on the new Power Macs, and the new 2.3 GHz model outperforms the old 2.5 GHz model handily when it comes to memory access. The 2.5 GHz scored 104, the new 2.0 GHz rated 110, and the new 2.3 GHz topped them both at 122. Other benchmark tests are more tied to raw CPU speed or other parts of the system, such as the graphics subsystem and the hard drive used. At present, that’s all we have for independent performance testing. Apple claims that the 2.5 GHz Quad outperforms the 2.7 GHz dual by 22% to 76% depending on the task. We do know that the new Power Macs offer more performance per GHz than their predecessors. Exactly how much is something we’ll learn later. For the purposes of comparison, we’re assuming that the newest Power Macs are perhaps 10% faster overall than the PCI and PCI-X models they replace. The 2.0 GHz Dual retails for $1,999 (all prices are in US dollars), the 2.3 GHz Dual for $2,499, and the 2.5 GHz Quad – which won’t ship until November – for a whopping $3,299. By comparison, the previous generation Power Macs are being closed out as follows: 2.0 GHz, $1,899 and 2.7 GHz, $2,799. A few dealers have 2.5 GHz models available for as little as $2,299. None of the dealers I checked have the dual 2.3 GHz models available. Before we go any further, there is one advantage the older Power Macs have over the newest ones – PCI slots. If you need to use a PCI or PCI-X card, you can do so with the older models. With the newest Power Macs, you have to use PCI Express (PCIe) cards. You can save $100 by choosing the older 2.0 GHz model. Although we don’t have benchmarks to show how much faster the dual-core models are than the dual-processor models, I’m guessing they’ll more than make up the 5% difference in price. Unless you have other compelling reasons (such as PCI cards) to stick with the older architecture, spring for the new 2.0 GHz Dual. If you can find 2.3 GHz models on close-out, you probably won’t save more than $100-150. Again, unless you have a compelling reason (maybe you have PCI-X cards), the new dual-core model will provide more power and better value. Two 2.7 GHz CPUs vs. two dual-core 2.5 GHz CPUs? No contest! The Quad provides a whopping 10 GHz of G5 performance. It makes you wonder what kind of wonders Apple and Intel will come up with when the Power Mac goes Intel. The new Quad sells for $500 more than the 2.7 GHz dual, a difference of roughly 18%. I’d hazard a guess we’re going to see CPU-bound tasks run 60-80% faster. The new memory bus is one-third faster. And PCI-Express smokes PCI-X. The only thing that won’t be faster is the hard drive. For the difference in price, wait until the new models ship in November. The 1.8 GHz PCI model is the value champion at $1,299. At $700 less than the new 2.0 GHz Dual, it merits very serious consideration, especially if the 8x single-layer SuperDrive isn’t something you’d consider a drawback. It may not be state of the art, but clock speed is only 10% slower while the price is 35% lower. The 2.0 GHz PCI-X model provides 10% more speed than the 1.8 GHz PCI model, but at a nearly 20% premium. Unless you have a reason to choose PCI-X over PCI expansion slots, it’s not as good a value. The 2.3 GHz PCI-X model sells for the same price as the new 2.0 GHz Dual and saves you $500 (20%) compared with the new 2.3 GHz Dual. Performance is probably a bit faster than the new 2.0 GHz model and slightly slower than the new 2.3 GHz Power Mac. It does have those PCI-X slots, which will be a factor for some users. Overall, I’d say the price difference exceeds the performance difference making the PCI-X model the best value of the three, but there may be other factors to consider such as slots, maximum RAM, and the importance of a dual-layer SuperDrive. If you’re looking for a top-end no-holds-barred production machine, wait for the 2.5 GHz Quad to ship in November. If you’re looking for a great budget Mac with horsepower to spare, the refurbished 1.8 GHz dual PCI model merits serious consideration. If you’re like most Mac users, you’ll never use any of the expansion slots, so it doesn’t make much difference whether they’re PCI, PCI-X, or PCI Express. In the middle, I’d look at the refurbished 2.3 GHz PCI-X at $1,999. Regardless of your choice, all of these dual-core and dual-processor models provide vast amounts of power. And if that isn’t enough, the dual-core dual-processor Quad is coming in November.